How unfair that Edward Elgar has been painted into a patriotic corner. As I listened again this morning on CD to Sir Adrian Boult's towering interpretation of The Apostles I was reminded of how Elgar's music is rooted not in England's Protestant culture, but in a great and inclusive mystical tradition. Elgar was a Roman Catholic, and Catholics are banned from the throne of the United Kingdom by the Act of Settlement of 1701 and Catholic emancipation was not made law until 1829, just 28 years before Elgar was born. Elgar is seen in the header photo putting the finishing touches to the Dream of Gerontius. This uses a text by Catholic mystic Cardinal Newman and Pope Pius XII described the work as "a sublime masterpiece" after a performance conducted by Sir John Barbirolli at the pontiff's summer residence in 1958. Bede Griffiths (1906-1993) was another Catholic mystic and is known for his pioneering and controversial links with Hinduism. In the late 1930s the young Cornelius Cardew, later to become a hard line Maoist, met Bede Griffiths several times at the cottage of Cardew's father, the potter Michael Cardew in Winchcombe, Gloucestershire. The title of my surprisingly popular post on Bede Griffiths says it all - This man is dangerous. * The Kingdom with Margaret Price, Yvonne Minton, Alexander Young, John Shirley-Quirk and the London Philharmonic Choir and Orchestra conducted by Sir Adrian Boult is available on EMI Classics. This is surely another sublime masterpiece, if it is not in your collection it should be. Ironically in view of my comments above, the coupling is Elgar's Coronation Ode conducted by Philip Ledger. I once asked the recording's producer, Christopher Bishop to name the best sounding record he had ever made. He unhesitatingly replied the Coronation Ode, which he produced in his beloved King's College Chapel, Cambridge. It plays as I write, with an acoustic like that who needs digital reverberation? 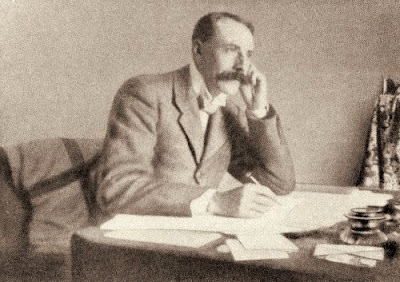 ** Elgar acknowledged the influence of the music of German composer Philipp Wolfrum (1854-1919) on The Kingdom and he conducted Wolfrum's Weinachtmysterium op. 31 at a concert in Worcester in 1901. Wolfrum is a forgotten figure from the romantic period and I do not know his music. Elgar's advocacy cannot be ignored and further detective work could be rewarding.